Regular: Certified Non-GMO, Chosen Foods Virgin Sesame Oil has a beautiful yellow color and robust flavor from the sesame seed. A highly fragrant oil, very elegant in its aroma and taste, Chosen Foods Virgin sesame oil adds an authentic Asian flavor to any dish. Spicy: Certified Non-GMO, Chosen Foods Spicy Sesame Oil is infused with Chili and garlic to create a beautiful red color and mild spice. A highly fragrant oil, very elegant in its aroma and taste, Chosen Foods spicy sesame oil adds a deep flavor and delicate kick to any dish. With a “medium” spiciness level, increase or decrease the kick in your dish by adding more or less oil. Toasted: Expeller pressed, toasted sesame oil adds authentic mild flavor to Asian dishes, but doesn't stop there. The health benefits of extra virgin sesame oil date back centuries, attributed to its powerful antioxidants sesamol and sesamin. 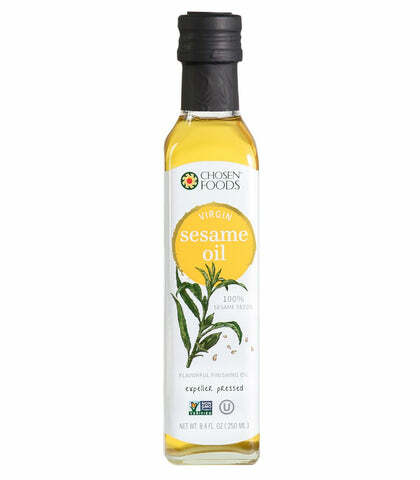 The perfect finishing oil, add toasted sesame oil to your dish after the heat has been turned off.A highly fragrant oil, very elegant in its aroma and taste, Chosen Foods Toasted sesame oil adds an authentic Asian flavor kick to any dish. Regular: The perfect finishing oil, add Virgin Sesame oil to your dish after cooking. It is an ideal way to add an Asian flare to a stir-fry, soups, salad dressings, vegetables, or noodle dishes. The natural yellow color is a beautiful addition in the plating and presentation of all your dishes. Spicy: The perfect finishing oil, add spicy sesame oil to your dish after cooking. It is an ideal way add a spicy Asian flare to a stir-fry, soups, salad dressings, vegetables, pasta dishes, and even scrambled eggs. The light red color (created naturally from the Chile infusion) is beautiful in the plating and presentation of all your dishes. Toasted: The perfect finishing oil, add Toasted Sesame oil to your dish after cooking. It is an ideal way add an Asian flare to a stir-fry, soups, salad dressings, vegetables, or noodle dishes. The deep brown color (created naturally from the roasted seed) is beautiful in the plating and presentation of all your dishes. Best used for flavoring, drizzled over dishes, or added to dressings, sauces, and marinades. Chosen Foods was founded by a well traveled Naturopathic Doctor who discovered the powerful effect traditional foods were having in their native cultures. He was inspired to share these ancient superfoods with the rest of the world - and so our journey began. His vision centered around the idea that food should nourish and sustain our bodies, our lives and our communities. Learn more about our founding leadership team here. A few years, some big changes and several products later, our integrity and core values remain the same. The mission of Chosen Foods is to support true nourishment through the rediscovery and accessibility of real food. At a time when food is often fast and convenient, we encourage people to slow down. We want to inspire folks to get in the kitchen and put real food back on the table. We believe the act of cooking and the time spent around the dinner table should be savored.